I still read my FL though! I present to you Kabouter Aapje (Gnome Monkey)! I can't stop laughing. I am feeling terribly amused with myself and can't wait to figure out what crazy thing to do with a monkey next! tijntje used some of his overtime to buy a new TV/monitor awhile ago and when we plugged it in it was making a really horrible high pitched noise that just never stopped. We couldn't return it so we sent it back to Samsung and said "HALP!" Really though, it wasn't bothering tijntje, but it was making my brain bleed... we got it back last weekend and so far it seems to be quiet enough. If it's making a noise, at least this time it's out of the range of BOTH of our hearing instead of just his. Syndicated (RSS) feeds aren't updating, and I don't THINK they've been updating for a week or two. Dumb. I thought it was a problem with the RSS feed on my other blog, but then I realized I hadn't been getting ANY of my feeds on my friends page... I wonder how long it'll take them to sort it out. Anyhow, I've been pretty rubbish at updating my LJ, so if you really want to keep track of me I've been better about posting here. I am still reading my FL though so don't think I've completely abandoned you! 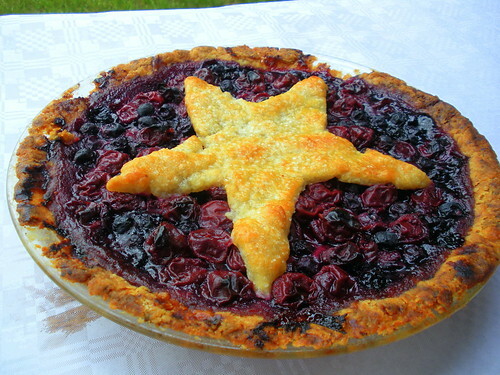 Cherry Blueberry Pie. It's extra special (or I'm extra stupid) since it was baked when it was 90 billion degrees outside with 900000% humidity. Can someone please please figure out someway to dehumidify the air?! It's sucking away my life! Because I was feeling seriously irritated (probably irrationally irritated, but you know how it is sometimes) about the YOUR COMPUTER WILL EXPLODE comments that I got, I did some digging around. I couldn't find any incidences of fleece damaging laptops. There were a few hits wondering about it, but no one could say "Hey, I used a fleece case and my laptop went kaput because of it." I e-mailed two case manufacturers that used fleece as an interior lining on their cases. I also e-mailed Acer and asked them if a fleece case was safe to use. To be honest, I've never heard of fleece causing such a problem with laptops! Further, I've never heard from a customer saying that they've experienced problems that they suspect could be attributed to our laptop sleeves. Kim, it is safe to use fleece lined sleeve for covering the system. 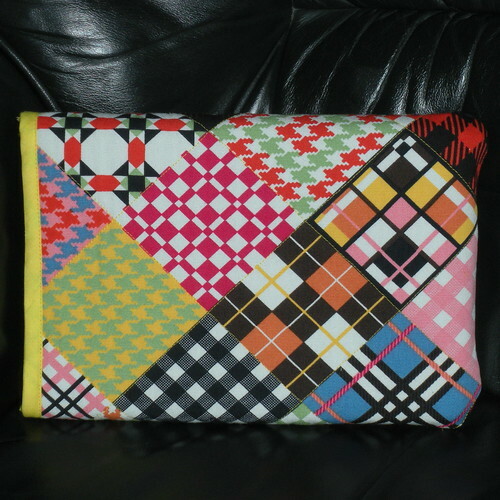 I made a case for Nettie the Netbook. But, not only will it wipe out all of my data, but it is also going to MAKE MY COMPUTER EXPLODE!!!!11!!elventy!!!!!. Just incase you didn't get the point.. But see, here's the thing- laptop manufacturers have actually taken the problem of static into consideration when they designed them. The pieces that can be damaged with static are protected to prevent that happening. Imagine that. So the chances of a fleece lined sleeve actually MAKING YOUR COMPUTER EXPLODE are about nil. Granted, YMMV, but considering that most of the commercially available sleeves are -also- lined with fleece, I'm going to take my chances. I'll be sure to have tijntje update if I get exploded in the process of using my very dangerous sleeve. 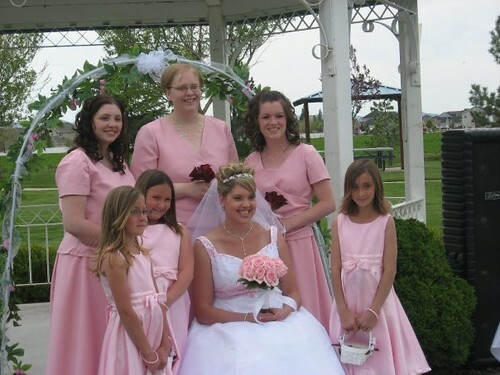 Let us keep our fingers crossed that this is the last and final time I will ever have to have bridesmaid duties. I think 5 times is enough. I should -just- be getting ready to land in Minneapolis tomorrow around this time. Whoo! Then I have a 4 ish hour long layover. I wish it was a little shorter, but I never know how long I'm going to be stuck going through immigration and customs. When I have a long layover it usually takes 5 minutes and when I have a short layover I am always freaking out because there's NOT ENOUGH TIIIIME! We went out and enjoyed the weather today. Took a reasonably long bike ride on the way to a geocache and then decided that we weren't smart enough to decipher the clue *L* We've since figured out probably what it meant so we'll go back out another day and try to find it. I'm not entirely convinced that someone isn't pumping laughing gas into our apartment, we've both had the giggles all day long.